American Park Specialties designs and manufactures environmentally friendly commercial children's playground equipment and park accessories. With a strong commitment to providing fun and safe environments for families as well as to the preservation of the Earth's natural resources. 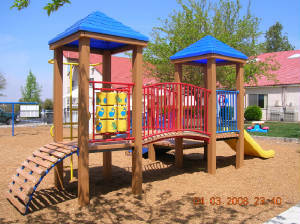 American Park Specialties uses 100% recycled plastic to create play structures and other site amenities that are safer and more durable than conventional wood and metal equipment.